I was starring at the computer screen for the final clustering result. Finally, I opened the output file and found the first cluster with more than 90% of the data-points. 6 other clusters composed the 10% of the remaining data-points. I packed up my bag and thought over the possible reasons of this dramatic failure of the technique on the way home. This article will illustrate how to tackle such problems in a systematic manner by exploring the possible reasons of such failure. 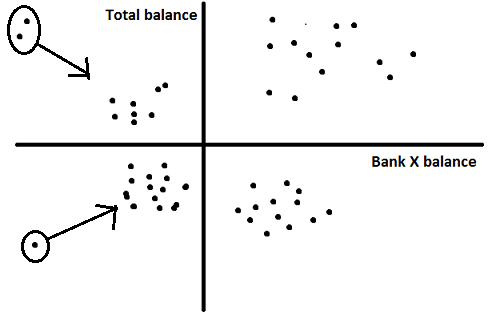 As this is the second part of the concept (please read basics of clustering here), we assume the reader is comfortable with the two clustering techniques widely used in the industry and their mechanisms. 1. Data-points within same cluster share similar profile : Statistical method to judge this criterion is simply checking the standard deviation for each input variable in each cluster. A perfect separation in case of cluster analysis is rarely achieved. Hence,even one standard deviation distance between two cluster means is considered to be a good separation. 2. Well spread proportion of data-points among clusters : There are no industry standards for this requirement. But a minimum of 5% and maximum of 35% of the total population can be assumed as a safe range for each cluster. This does not qualify as a good cluster analysis. 1. Outliers still present : Try making outlier definition stricter. This has been a savior for me in most of the cases. Try capping and flouring instead of removing the outlier. 2. Presence of overshadowing variable : This kind of variable generally become visible in the FASTCLUS output, in the significance table. If the significance index of a particular variable is exceptionally high, try replacing it with the next best variable. This next best variable can be found at the VARCLUS step. What if the problem still remains? What does this indicate? It indicates that the population is too homogeneous to be segmented. This problem is the hardest nut to crack. Try incorporating more data points to start with. If the problem still remains we need to do clustering at a finer level. We will now discuss this method in detail. 1. Hierarchical Clustering : The advantage of this technique is that it becomes very handy to club different data-points. In other words, the output of the model is a tree and we can choose any combination from the tree to build clusters for different number of clusters. The disadvantage of technique is that it can handle only few data-points and takes exponential time for the high number of observations. If this were not a constraint for the technique, no cluster analysis would have failed. 2. k-means Clustering : The advantage of this technique is that it can handle huge number of observations and takes very less time compared to all other available techniques. The disadvantage of the technique is that changing the process in between to club data-points to the second best cluster is not possible. Hence, the method is much more rigid when compared to Hierarchical Clustering. The two techniques have opposite pros and cons and hence can be used together to compliment each other. What if we combine the two methods? We get 10 smaller clusters with size ranging from 2-25% of the same population. The output of this step is a set of clusters complying to both the constraints of a good clustering analysis. As the method demonstrated above uses finer differences between observation, which were not differentiated by simply using k-means, the technique needs to be verified for the separation test. In such cases, when strong separation is not possible between observations, vastly different actionable should not be taken for each cluster. What do think of this technique? Do you think this provides a solution to any problem you face? Are there any other techniques you use to improve separation of your clustering models ? Do let us know your thoughts in the comments below. Can you throw some light on the output results that come out of running PROC VARCLUS and FASTCLUS and explain the interpretations and industry standards? For example things like “cubic clustering criterion”. If you can take the output and provide some examples that would be great! 1. I have a dataset of ~5 lakhs records and a system of high computation. I am able to perform both k means and heirarchical in R successfully. Which method should I prefer? 2. I have a dataset of 5 lakh rows and 50 variables. There are categorical variables with multiple categories (~Eg. State) and there are nominal categories (~Eg. loan issuance year). How do I handle such categorical and nominal categories? I am using R and am not aware of the any procedure which might replicate VARCLUS procedure in R.